We are garden fairies and we were definitely unequivocally not going to post again so soon but something has been brought to our attention that has us all up in arms. We are a-tither about the goings on that go on around here and feel it is our duty as garden fairies to report what has gone on here at May Dreams Gardens. As many gardeners know, this is the time of year when the daylilies are starting to bloom. 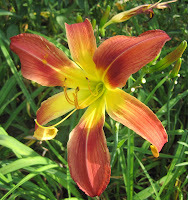 Carol has quite a few daylilies in Plopper's Field including this spider-form one that she can't remember the name of and really, there is a label down near the base of this plant somewhere but it has probably washed off because Carol does not have a good system for labeling plants. Anyway, we are garden fairies and we don't really give a blooming radish what the names of the daylilies are, we just like to admire them and have our little dancing and drinking parties when they start to bloom. Well, enough about us. Guess what we found blooming in Plopper's Field where Carol just plops all kinds of plants willy-nilly? 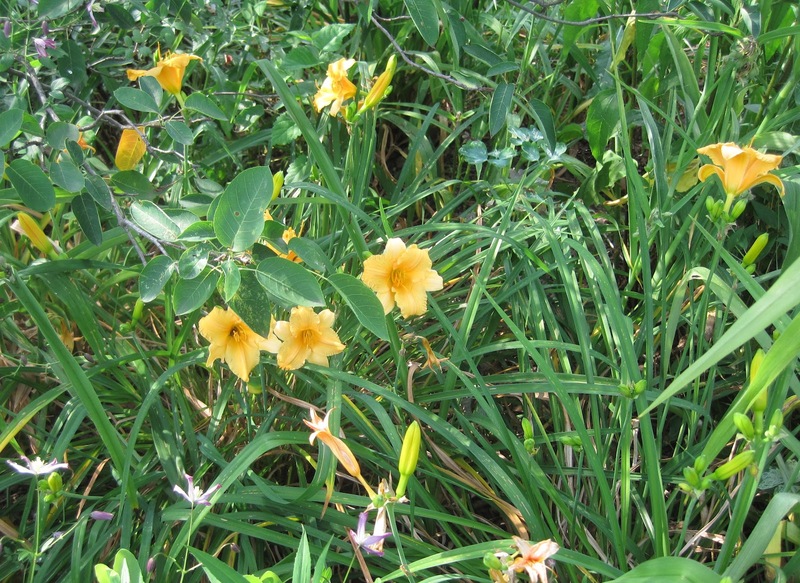 If those aren't those common as dirt 'Stella de Oro' daylilies then we aren't garden fairies. And we are garden fairies. We thought for sure that Carol had broken it off with "Stella" daylilies and unceremoniously removed them from the garden. But look, there they are again. What is up with that? It's like you can never get rid of 'Stella de Oro' daylilies once you have them. Oh sure, they are nice enough, but they are everywhere. They are like plant tramps. They hang out at the mall, the gas stations, half of the neighbors' mailboxes, schools... really, they are everywhere. And by everywhere, we also mean Plopper's Field here at May Dreams Gardens, too. We are garden fairies. Us common folk are not as easy to get rid of as you think! Where others faint from heat, or freeze in the cold, we are survivors! Really Thorn, you can never get every little bit of root of those Stella's, even if they disappear for several years they shall return. Like Ah-nald. They are so very common aren't they? Some of those STD's (an apt name) are in a prominent location in one border here as well and if that isn't bad enough, what about that raucous color? "Plant Tramps"....I like it. A perfect metaphor. I'm pretty much a teetotaler myself, but I'd love to hear the story of Sweetpea sometime. What kind of wine do fairies like and do you leave a bottle out now an then to satisfy their botanical needs? Just cleaned out the day lilies here at the farm yesterday, removing spent stalks and leaves and watering. Today they'll get a little garden soil and some fresh mulch because my mother-in-law can't really take care of them much any more. Nice to be gardening.